For ither uises, see Megara (disambiguation). Megara (/ˈmɛɡərə/; Greek: Μέγαρα, Greek pronunciation: [ˈmeɣara]) is a auncient ceety (pop. 28,591 in 2011) in Attica, Greece. It lies in the northren section o the Isthmus o Corinth opposite the island o Salamis, which belangit tae Megara in airchaic times, afore bein taken bi Athens. Megara wis ane o the fower destricts o Attica, embodiet in the fower mythic sons o Keeng Pandion II, o whom Nisos wis the ruler o Megara. Megara wis a tred port an aw, its fowk uisin thair ships an walth as a wey tae gain leverage on airmies o neebourin poleis. Megara specialisit in the exportation o oo an ither ainimal products includin livestock sic as horse. It possessed twa harbours, Pegae, tae the wast on the Corinthian Gulf an Nisaea, tae the east on the Saronic Guwf o the Aegean Sea. In historical times, Megara wis a early dependency o Corinth, in which capacity colonists frae Megara foondit Megara Hyblaea, a smaw polis north o Syracuse in Sicily. Megara then focht a war o unthirldom wi Corinth, an efterwairds foondit (c. 667 BC) Byzantium, as well as Chalcedon (685 BC). Megara wis kent for its money in historical times. In the late 7t century BC Theagenes establisht hissel as tyrant o Megara bi slauchterin the cattle o the rich tae win ower the poor. Durin the seicont Persie invasion o Greece (480-479 BC) Megara focht alangside the Spartans an Athenians at crucial battles sic as Salamis an Plataea. Megara's defection frae the Spartan dominatit Peloponnesian League (c. 460 BC) wis ane o the causes o the First Peloponnesian War. Bi the terms o the Thirty Years' Peace o 446-445 BC Megara wis returned tae the Peloponnesian League. In the Peloponnesian War (c. 431 BC-404 BC), Megara wis an allee o Sparta. The Megarian decree is considered tae be ane o several contributin "causes" o the Peloponnesian War. The Megarian decree wis issued bi Athens wi the purpose o chokin oot the Megarian economy. The decree statit that Megarian merchants wur no alloued in territory controlled bi Athens. The maist famous ceetizen o Megara in antiquity wis Byzas, the legendar foonder o Byzantium in the 7t century BC. The 6t century BC poet Theognis came frae Megara an aw. In the early 4t century BC, Euclid o Megara foondit the Megarian schuil o filosofie which flourisht for aboot a century, an became famous for the uise o logic an dialectic. The Megarans wur proverbial for thair generosity in biggin an endouin temples. Jerome reports "Thare is a common sayin aboot the Megarians […:] 'They build as if they are tae live foriver; they live as if they are tae die tomorrae.'" A population o 28,195 live athin the municipality. It is locatit 42 kilometres (26 miles) (WNW) o Athens in the soothwastren pairt o Wast Attica Prefectur, an is linkit bi a heich-gate connectin the Peloponnese, Wastren Greece, an Athens. It is nou linkit bi a heich-speed rail line suburban railwey. Megara lees in the Megaris plain. It haes the lairgest laund aurie in ony municipality in the Attica region, an the lairgest population in Wast Attica. Agricultur uised tae dominate afore hoosin began tae expand in Megara in the 1960s an the 1970s. 3 kilometres (2 miles) sooth o Megara is a smaw commonty cried Pachi, which is famous for its fish tavernas an is visitit bi fowk frae aw ower Greece. Nea Peramos is the neebourin ceety tae the east o Megara an Kakia Skala tae the wast o Megara. Thare is a militar airport tae the sooth. Sooth o Megara is the Guwf o Megara. The lairgest ither touns in the municipality are Kinéta (pop. 1,972), Spárta (712), Vlycháda (694), an Aigeiroúses (479). 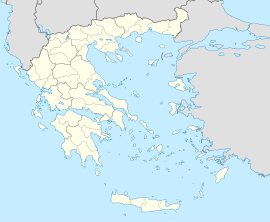 The municipality is unuisual for ane its geographical size, in that it haes anerly ane municipal destrict, the third-lairgest in Greece (efter the Sílis destrict in Paranesti an the Mikró Déreio destrict in Orfeas) if Munt Athos is no coontit. Thare are, housomeivver, 14 touns or veelages in the municipality. ↑ Sarah B, Pomeroy, Stanley M.Beloniqua, Walter Donlan and Jennifer Tolbert Roberts, Ancient Greece: A Political, Social, and Cultural History (Oxford: Oxford University Press, 1999). Legon, Ronald P. Megara: the political history of a Greek city-state to 336 B.C.. Ithaca, NY: Cornell Varsity Press, 1981. Smith, Philip J. The archaeology and epigraphy of Hellenistic and Roman Megaris, Greece. Oxford: John an Erica Hedges Ltd, 2008. "Megara". Catholic Encyclopedia. New York: Robert Appleton Company. 1913. This page wis last eeditit on 5 Mairch 2018, at 00:58.